On July 8, Dole and his law firm, Alston & Bird LLP, registered to lobby for Bridgepoint, which has some 50,000 students at its Ashford University and University of the Rockies and last year received $639 million from the U.S. Department of Education for student aid. According to a federal disclosure form, Dole and two colleagues will lobby on the issue of "Post 9/11 G.I. Bill Benefits," meaning educational benefits from the Department of Veterans Affairs for U.S. military veterans. For-profit college companies, many of which get some 90 percent of their revenue from federal taxpayer dollars, have been spending heavily to buy friends in high places -- former top government officials like Bob Dole and other esteemed Americans who can endorse them and pressure the White House and Congress not to hold their businesses accountable for waste, fraud, and abuse. Bridgepoint might need more Bob Doles, and soon. Its legal problems just got worse. According to a report the company filed this morning with the Securities and Exchange Commission, on July 7 -- the day before Dole filed his lobby disclosure form -- the U.S. Justice Department hit Bridgepoint with a civil investigation demand aimed at determining whether the company misrepresented its revenue from private student loans and thus its compliance with the federal 90/10 rule, which requires for-profit colleges to get at least 10 percent of their revenue from sources other than the U.S. Department of Education. Bridgepoint also disclosed in the filing today that the Department of Education is expanding its own probe of the school's financial aid practices. Bridgepoint and other for-profit colleges have engaged in aggressive recruiting of U.S. military service members and veterans, especially because, through a loophole in federal law, Pentagon tuition assistance and the G.I. Bill dollars for which Dole is now lobbying do not count toward the 90 percent federal aid ceiling. A 2009 Bloomberg story about for-profit college recruiting on military bases began with this account of a U.S. marine attending a Bridgepoint school: "U.S. Marine Corporal James Long knows he's enrolled at Ashford University. He just can't remember what course he's taking. The 22-year-old from Dalton, Ga., suffered a traumatic brain injury, impairing his ability to concentrate, when artillery shells hit his Humvee in Iraq in 2006. He signed up for Ashford, one of at least a dozen for-profit colleges making money off active-duty military with subsidies from American taxpayers, after its recruiter gave a sales pitch this year at a barracks housing the Wounded Warrior Battalion at Camp Lejeune in North Carolina." When San Diego-based Bridgepoint bought a Clinton, Iowa, 87-year-old religious college, The Franciscan University, along with its accreditation, in 2005, and turned it into for-profit, largely online Ashford University, the town expressed concern about the future of the campus and the jobs it provided. Ashford's new president promised the Clinton city council, "We will never, ever get rid of the Clinton campus." In summer 2015, capping a decade of troubling behavior, Ashford announced it was getting rid of the Clinton campus. In March 2011, Senator Tom Harkin (D-IA) held a hearing focusing on Bridgepoint. Harkin presented a series of charts showing that the company had seen rapid growth, with revenues increasing from $33 million in 2008 to $216 million in 2010, while experiencing mounting student loan default rates. Harkin said Bridgepoint was "a scam, an absolute scam ... premised on aggressively recruiting largely low-income, disadvantaged students ... collecting their federal grants and loans even as the vast majority of students drop out ... and lavishly rewarding executives and shareholders with mostly taxpayer dollars." He concluded, "From a strictly business perspective, this is a highly successful model. But, I must say, from an educational perspective -- and, frankly, from an ethical perspective -- it is deeply disturbing model." Senator Harkin's 2012 report on the for-profit college industry found that Bridgepoint taught its recruiters "a sales technique known as 'overcoming objections.' If a student presented an 'objection' to enrolling, recruiters were instructed to think of this as a 'buying signal' that tells the recruiter 'the student is still paying attention and the "sale" is still alive!' If a student objected that the cost of attending is too high, the recruiter was taught to respond with questions such as, 'Investing in yourself . . . You're worth it right?,' and 'how much more will you make once you have your degree?,' and by discussing how 'financing options [are] available for those who qualify.' If a student raised the 'credibility/reputation' of Ashford, recruiters were taught to recite promotional statements about how the college was 'established in 1918,' discuss the 'traditional 4-year campus with sports teams, dormitories,' and how the college has been 'regionally accredited since 1950.' In fact, Ashford University ... is an entirely different institution than the small religious college that Bridgepoint purchased in 2005. Ninety-nine percent of students do not attend the small Iowa 4-year campus." The Harkin report contains accounts by students who contend they were misled by Bridgepoint recruiters, including a veteran who was told his GI bill benefits would cover the entire cost of his degree, only to find out after he was enrolled that he would owe approximately $11,000 out-of-pocket; and a student told that his program would allow him to become a licensed dental assistant only to find that claim was false. The Harkin report found that Bridgepoint spent 29.7 percent of its revenue -- $211.6 million -- on marketing and recruiting, a higher proportion of its than any other publicly traded education company, and more than twice what the company spent on teaching students. The report also noted that in 2009 Bridgepoint CEO Andrew Clark received $20.5 million in total compensation -- 33 times what the president of the University of Iowa earned. In May 2014, Bridgepoint agreed to pay $7.25 million to settle claims by Iowa Attorney General Tom Miller that the company violated Iowa's Consumer Fraud Act. Miller said at time, "Our investigation found what we allege was troubling conduct by Ashford recruiters, including misleading prospective students to encourage them to sign on the dotted line. Unfortunately for many Ashford students, they didn't get the degree they hoped for or the job they were led to believe they'd get after graduating. What they did end up with was a crushing amount of student loan debt." Miller alleged "unconscionable sales practices through which Ashford telemarketers, under significant pressure to enroll students," violated the law. These included: making false or misleading statements to prospective students in order to convince them to enroll; utilizing unfair and high-pressure sales tactics, including emotionally-charged appeals to persuade prospective students to make uninformed decisions to enroll; misrepresenting to prospective students who wished to become teachers that an online Ashford education degree would allow them to become classroom teachers when, in fact, many Ashford graduates are subject to additional requirements that may require additional time, coursework, or money. Bridgepoint denied the charges. Bridgepoint filed a disclosure form with the SEC in November 2015 indicating that the company is now in hot water with the Department of Education, which notified the company that, because of concerns about the inadequacy of Bridgepoint's responses to information requirements, "the Department will not make any decisions regarding the addition of any new programs and locations until the reporting requirements are met." Bridgepoint has also been under investigation in recent years and months by the Securities and Exchange Commission, the Consumer Financial Protection Bureau, and the attorneys general of California, North Carolina, New York, and Massachusetts. Dole lost his race for the White House to Bill Clinton in 1996. He also lost as Gerald Ford's GOP running mate in 1976. 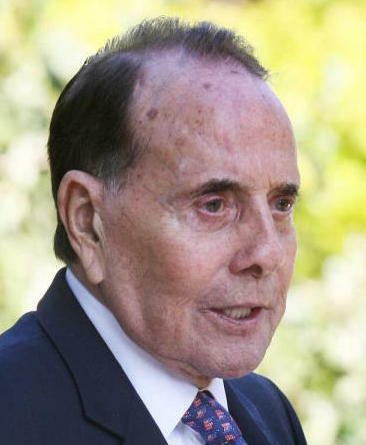 Dole, a decorated World War II hero, retired from Congress in 1996 after 35 years of service there.